The Scripps Institution of Oceanography at UC San Diego has released a new map of the world’s seafloor – the first in nearly 20 years – which exposes new terrain, including thousands of mountains. The unprecedented detail was attained using radar satellites that captures gravity measurements of the ocean seafloor. Armed with this more precise understanding of what lies beneath the world’s oceans, scientists can now establish more sophisticated and accurate climate models, as well as gain new clues on how the continents as they stand today formed past the eons. A new gravity model gives us the clearest picture of the world’s seabed up to now. Mapping the surface of our planet’s seabed is a very important job, but also a highly challenging one. Scientists can not perform this job using the same tools for mapping mountains, hills and other terrain above sea level, since seawater is opaque to these methods. A really accurate reading can be achieved by ships carrying echosounders which bounce off sounds from the watery depths below, but it would take too much time and money to do this for the whole world’s seabed. Many features are also hidden by sediments, which renders sonar ineffective in this case. Generally, researchers turn to this technique when they really want to have a fine grained picture of the ocean’s bottoms, for a given area for different purposes. On a planetary scale, radar satellites are much more effective, though. A new seafloor map reveals fracture zones which tell scientists about the movement of the continents. Satellites fitted with radar altimeters can infer the surface of the ocean bottom from the surface of the water high above. Because water follows gravity, it is pulled into highs above the mass of tall seamounts, and slumps into depressions over deep trenches. 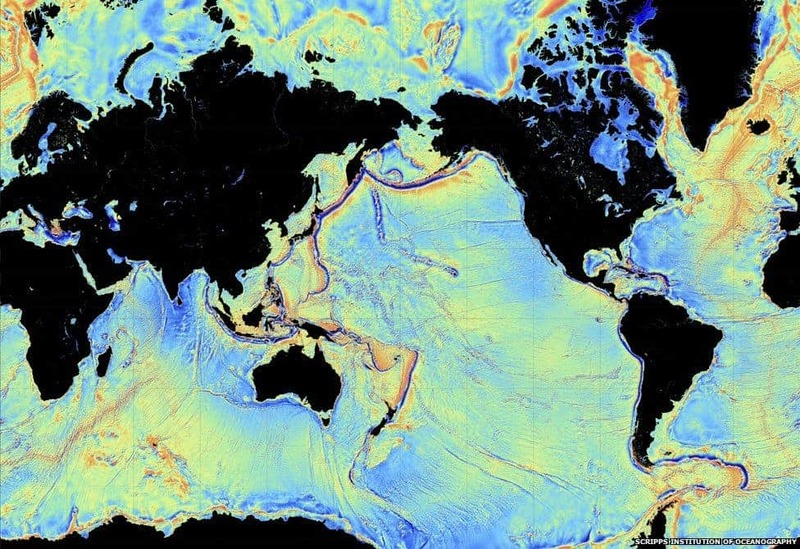 Key insight such as this made the gross maps we now have at our disposal, but advances in satellite technology have brought a two-fold improvement in the gravity model used to describe the ocean floor. This was possible thanks to data sets from the European Space Agency’s (ESA) CryoSat-2 satellite, which primarily captures polar ice data but also operates continuously over the oceans, and Jason-1, NASA’s satellite that was redirected to map the gravity field during the last year of its 12-year mission. Already, despite the work is far from finished, we can see an exponential growth in the detail available to us. “In the previous radar dataset we could see everything taller than 2km, and there were 5,000 seamounts,” Prof Dave Sandwell, a Scripps Institution of Oceanography researcher. “With our new dataset – and we haven’t fully done the work yet – I’m guessing we can see things that are 1.5km tall. “That might not sound like a huge improvement but the number of seamounts goes up exponentially with decreasing size. “So, we may be able to detect another 25,000 on top of the 5,000 already known,” he went on to explain. The newly released map now comes as a great tool for geophysicists looking to investigate remote ocean basins or ocean spreading centers. Abyssal hills – the most common land form on Earth – can now be more clearly discerned. These structures significantly influence oceans currents, and thus the climate. They’re also important to conservation efforts and fishery research since it’s around these kind of terrain that marine life tends to congregate. 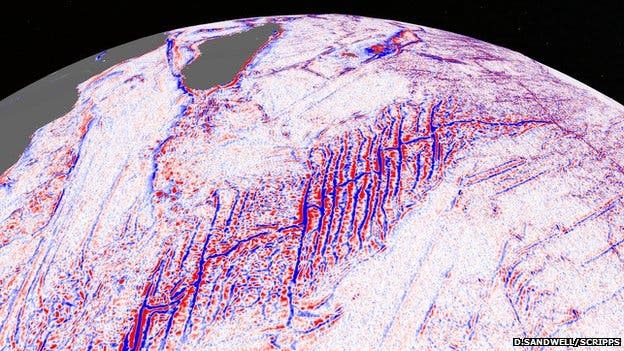 The research also offers new insights into the tectonics of the deep oceans. For instance, the map has exposed a previously uncharted continental connection across South American and Africa – a different type of ridge feature that became separated roughly 85 million years ago . What’s amazing is that one of the satellites used for the mapping, ESA’s Cryosat, was actually tasked with the primary mission of tracing the shape and thickness of polar ice fields – not the seabed. The technology onboard the satellite, however, proved to be invaluable for marine floor probing – something that became clear as soon as it took orbit. The paper was reported in Science.